Bako National Park, is one of the oldest national park in Sarawak, a state of Malaysia, on the island of Borneo. The national park was established in 1957 and it covers approximately 27 square kilometers in size. 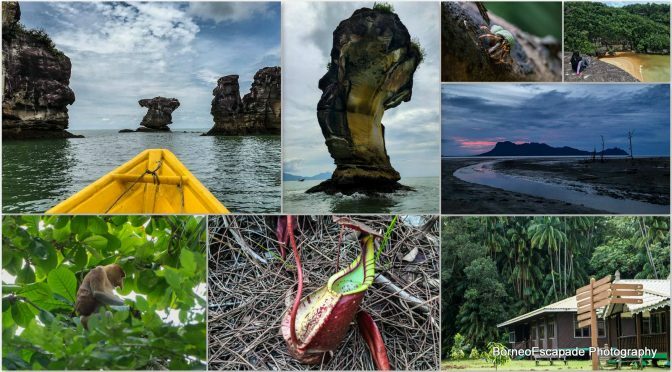 Despite its seemingly small size in comparison to other national parks in Sarawak, it has, according to Sarawak Tourism Board website, almost every types of vegetation that you can find on the island of Borneo which include Swamp Forest, Scrubland, Mangrove Forest, Dipterocarp Forest and Delicate Cliff Vegetation. Apart from types of vegetation, the website also claimed Bako National Park is home to many wildlife that include Long-tailed Macaque Monkeys, Silver Leaf Monkeys, Bearded Pigs, Squirrel, Monitor Lizards and the highlight, the Proboscis Monkeys that is endemic to the island of Borneo. Having said above, this writing is not about promoting Bako National Park but to document what I have discovered at this park during my 2 Day 1 Night visit as well as some tips and information that may be helpful for you guys who is planning to visit this park. Whether it is worth a visit or not, it will be up to you to decide.